Yesterday started out sunny and mild. Our temperatures reached 47 degrees. It was balmy and a perfect day for a ride. The footing wasn't too good though. I had barn chores to do anyway. I moved 63 bales from the top of the barn to the bottom. We are getting ready for our annual holiday trip and I want to make feeding as easy as possible for my mom. I also moved 350 pounds of grain. Pie and Sovey only eat a small amount of grain for vitamins so that should last them well into February. The entire time I was working, Sovey kept looking at me to see if I was coming out to get him. We had such a fun ride on Sunday and I think he wanted to go again. Both he and Pie remained clean until 3pm. Then, they just couldn't stand it another second. I was still working and I couldn't stop. Off they cantered to the muddiest spot they could find. 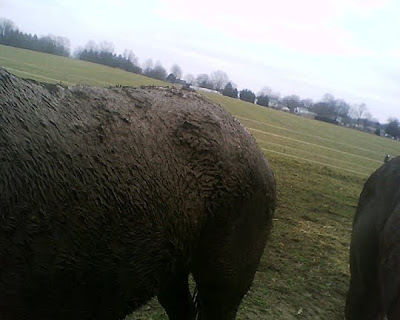 Above is a shot of Sovey's muddy rump. I honestly have never seen more mud in all my life. Ugh. Later, when Maizie returned from school, she told me the cutest story ever. 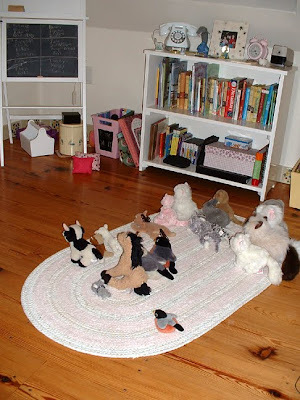 I have posted before about how she "teaches school" to her stuffed animals. You can read that post here. Well, Maizie told me that she was reading to her group and Noodlebug nonchalantly walked in and delicately picked up the littlest stuffed animal and casually walked out. 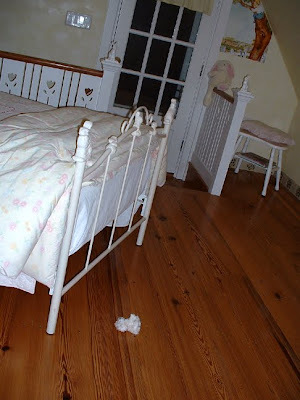 Maizie found the little animal at the foot of her bed. In the past, there were other animals that she had noticed that had been "kidnapped - catnapped" but she didn't know what had happened to them. This time, she saw the naughty thief in action! That Noodlebug - she is a silly one! The little robin in the bottom corner had a friend beside her, but it is missing. Here is the little friend! That's a great mud picture - it looks nice and fresh and wet! We're too cold for mud right now, which is OK with me! What is so screamingly funny about that story is not just that Noodle took the student, but that it was done NONCHALANTLY!!!!!! How adorable. Hey! I'll bet Pie Pie would like to attend that class!! !